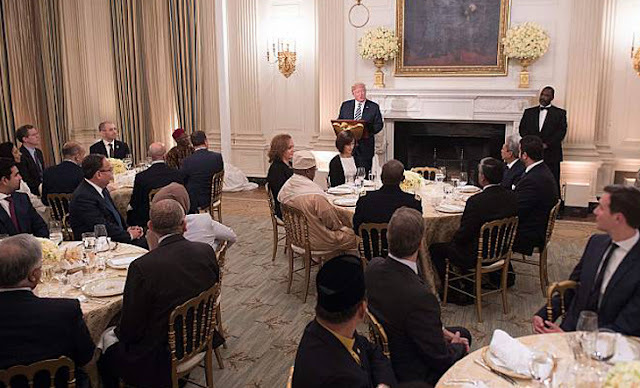 It is said that about 50 guests took part in the Iftar organized by Trump. Among them, ambassadors of administrative officials and several Muslim countries were present. At the same time, dozens of American Muslims protested against this iftar outside the White House. They organized alternate iftar in Lafayette Park, opposite the White House. Among the members of the tragedy to Iftar, Tram, US Vice President Mike Pence, Finance Minister Steven Mucin and Trump's son-in-law Jared Kushner Trump sitting next to Jordanian Ambassador Dinah Kawar in Iftar Among other Arab countries, Saudi Arabia, Egypt, UAE, Bahrain, Kuwait, Tunisia and Iraqi ambassadors were present at Iftar. Initiated the Trump Program, thanking the Muslim community in the United States and appreciating the economic condition of the United States. Then he said that iftar family and friends are one for celebrating peace. Trump said, only if we work unitedly, we can achieve a safe and prosperous future for all. He said that, because of this, I am proud to be in the forefront of the Muslim world as the first visit to the President. There I gave a speech at the conference of leaders of more than fifty Muslim majority countries. It was a big issue. Note that Trump was the first to travel to Saudi Arabia as the US president. Many major Muslim organizations in the United States did not participate in the Iftar event of Trump. Among them, the Islamic Society of North America and the Council on American-Islamic Relations They criticized the event, saying that the number of foreign delegates was more than American Muslims than it was. Every year, from the administration of Bill Clinton to the anniversary of the Iftar annually in the White House. The First Lady Hillary Clinton was the founder of Iftar's tradition at the White House. But Trump did not host any iftar last year.